Indiaplaza Blog For smart shoppers |: Bed Linens For Bedroom Makeover!!!! Bed Linens For Bedroom Makeover!!!! Like pillows, bed linens are especially overlooked when considering factors that contribute to a good nights sleep. But they are very important, they are your night “jacket”, providing warmth, insulation and comfort. To give a fresh look to your bedroom interiors bedding play a vital role. These can change the complete look of the room. As these are easily affordable, they can be used to give your room a new appearance every week. The room environment can become monotonous and uninspiring with the use of same kind of bed sheets every day. 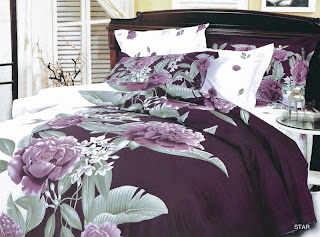 Weather of the place should be taken into consideration while choosing a bed linen. When you see a bright sunny day then light fabrics with colorful prints bring soft light at your place. In spring season go for the pastel shades and light cotton fabric with floral prints. This will add a new beauty to your room. Bed linen can be chosen according to the color combination of your room and interiors. You can use such colors which can bring a contrast with the interiors of the room. You can also try to mix-match the colors to bring a unique look to your room. All those bed sheets and linen exude opulence. As a real estate agent, I think those would be perfect for our new homes for sale. I'm glad you shared this wonderful idea.